Nearly all Lovable Loo users adopt an aerobic composting system. Basically they have a wire/wood bin on their lot somewhere and they empty the bins of waste into the bin to compost. If the mix of organic material, water, and air is maintained appropriately, these compost piles are efficient and fast at decomposing the waste. Aerobic composting does not smell, as the product of decomposition is largely C02, an odorless gas. The temperatures of composting are high enough that dangerous microbes are killed. However, this would not work on our site. First, I’m not wild about disturbing the landscape with a sizable composting bin. Second, I am also worried about maintaining the right conditions for composting when unattended. Instead we are trying anaerobic composting, which is composting in a sealed chamber without oxygen. (Basically there are two kinds of bacteria…aerobic and anaerobic. We’re using the anaerobic bacteria.) Here’s how it works. Each bucket of waste is capped tightly with the standard bucket lids (which are extremely secure…darn near impossible to get off without a tool). We mark the bucket with the date using a Sharpie. We then simply let the contents decompose anaerobically for at least one season. (It might take two, but that remains to be determined…report in Summer 2012) Once decomposed, the contents (which should be essentially soil and water) can be returned to the land. I punched a small hole in the lid (1/16″ diameter) to prevent any internal pressure from the build up of biogas (mostly methane). Incidentally, the holding tank of a septic system is basically an anaerobic composter…waste settles to the bottom and decomposes anaerobically. This is also how most sewage treatment plants work. The Lovable Loo system is relatively inexpensive, does not require any permanent fixtures in the hut, and thus can be abandoned at low cost if we don’t like it. However, if it works, it scales nicely to fewer/more people and is a pretty reliable low-fuss solution. Details on the Lovable Loo here. I also found the Humanure Handbook, written by the hippies who created the Lovable Loo, strangely interesting. hi, I was wondering how the anaerobic composting of your waste has worked out? Also I was wondering if you had found filling the bucket to the top with water was really necessary. It worked out very well. I need to post some results from this past year. After one year, the waste pretty much looked like wet, black dirt. I emptied it onto the ground a distance from the bunk house and it seems that it will quickly be absorbed into the ecosystem. I have not tried any controlled experiments to see how much water is required. I do believe the contents of the bucket have to be quite wet for anaerobic composting to work, but I’m not sure just how wet. Since there isn’t really any cost to me in filling the bucket with water, I’m not inclined to test my luck with that variable. I know it has been a while but I really like this idea. It is perfect for my tiny 144sqft cabin that will be used by two ppl (me and my wife) once every other weekend or so. I am not sure if you used this method indoors or not? I would like to use this indoors (in the bathroom of course. Any issues with that from your experience? Should be fine indoors. Our “shed” is perfectly pleasant — just mild odor of peat. Intriguing. My only concern is with your use of the peat moss, which is a non-renewable resource. It might be more sound to use an alternative, such as sawdust, or grass clippings. 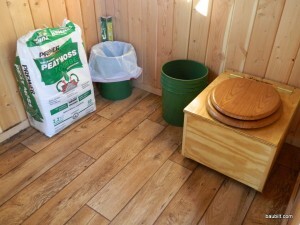 Just curious… Does anything else go in the bucket besides human waste, peat moss/sawdust and water? What about toilet paper in particular? Yes, TP composts just fine. Just wondering how many bags of peat moss did you use in a 2 week period for how many people? I think one of those dried/compressed bales from the garden center gets us through a season. For us, that is probably 4 weeks continuous use by 4-6 people. Saw dust also works well from what I understand. Thanks for the great info. Can you give an update on how the anaerobic composting is going and whether a year seems like enough time? We’re about four years into use of the composting system. So far it is is working very well. One year seems to be about right for adequate composting. (Of course the time will depend on ambient temperature, so colder climates may require more time and warmer climates less time.) The bucket definitely needs to be adequately hydrated — the only less-than-ideal results have been for buckets not filled with water before sealing.